When Winning at all Costs is No Win! I am regularly asked how many cases have I won? Potential clients, non-lawyers, friends and relatives use this terminology. But, winning a case isn’t really about winning. It’s about mitigating damages and liability. It’s about preserving finances and relationships, if possible. A win is really knowing the best and worst case scenario and achieving what you aimed for or better. When is a win not a win? When you leave a wake of havoc, of hate and a trail of tears. Unfortunately, some lawyers take this tactic in Family Law. They believe scorched earth is the best and only approach. What they do not tell their clients, though, is that it is really only what is best for themselves, the lawyer. It is best for the lawyer financially, or perhaps they even have a personal animus against the other party or the the other lawyer. Lawyers, in my experience, do not like to give the tough advice. That the fight is not worth it emotionally or financially. That if you win the other side ends up hating you and will spend the rest of their days waiting for you to mess up so they can pounce upon you. The win at all costs approach results in frivolous filings, extreme delay, and angry judges. The overwhelming “win” results in an appeal, bar complaints and ultimately you may well lose in the end. A Win is really not being unpleasantly surprised in the end result. A win equates with maintaining your relationships with your children and immediate family and having the means to provide a satisfactory life. 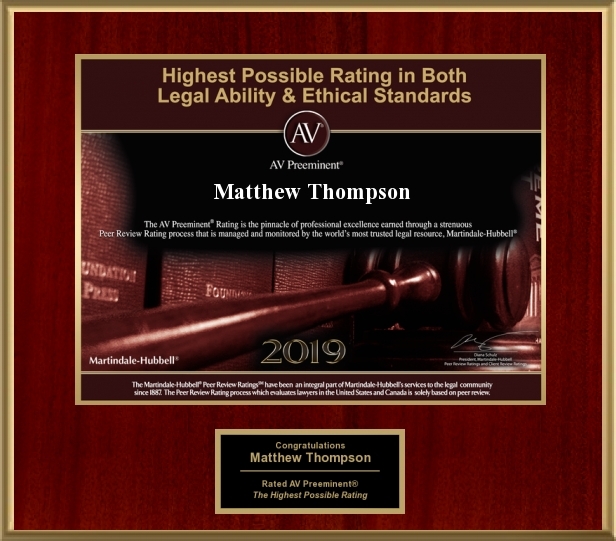 Matthew Thompson is a Divorce attorney and advises his clients when a win is a win and when it is not. Previous PostA little Monday Humor; Guide to Love & Lasting RelationshipsNext PostInfluencing Your Child (negatively) does NOT make you a good parent.